Now that the Alfa Romeo 4C has arrived at dealership showrooms a whole new generation of enthusiasts is being introduced to the legendary marque. These Alfa Romeo 4C reviews from well-known road testers give you a taste of what the 4C is all about. After you watch, follow the links below to learn more. 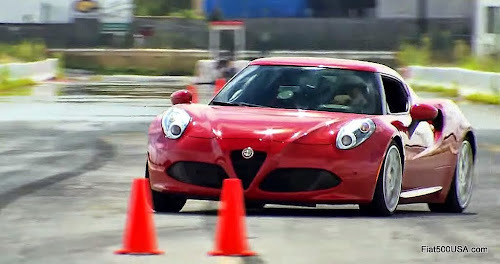 2015 Alfa Romeo 4C: The Most Affordable Supercar! There will be two versions of the Fiat 500X crossover available when the model shows up at Fiat Studios next spring. One will be the adventurous Trekking model, the other the sophisticated looking Street version. Both are well equipped and available in either front-wheel or four-wheel drive. The question is which version are you leaning towards? Fiat 500X Trekking models have rugged looking graphite and body colored front and rear fascia and unique trim that emphasize its sporty, outdoors nature. 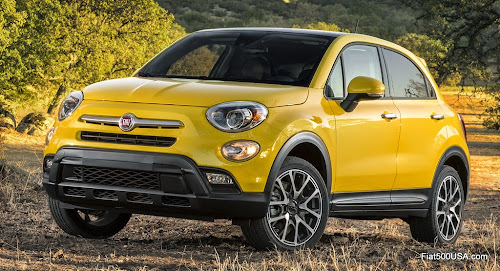 Fiat 500X Street versions encompass Pop, Easy, and Lounge models and show off the sophisticated side of the 500X. Elegant trim and stylish interiors are its hallmarks. Whichever model 500X you choose, you get a car filled with Italian style and high levels of standard equipment. Take a moment to review all the features and then vote for your favorite at the top of the page. 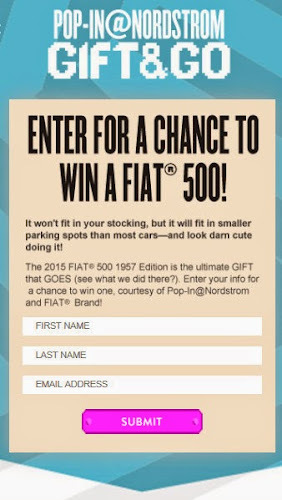 Make sure you tell us why on the Fiat 500X USA Forum! Matt Davis, Head of Product Marketing for Fiat North America, was recently interviewed on the Autoline After Hours news show. Davis answers questions about the new Fiat 500X and tells us where the car fits into Fiat's plans and the marketplace. Davis also took questions from viewers on a variety of subjects including diesels, quality and if the Fiat Panda will make it to the United States. 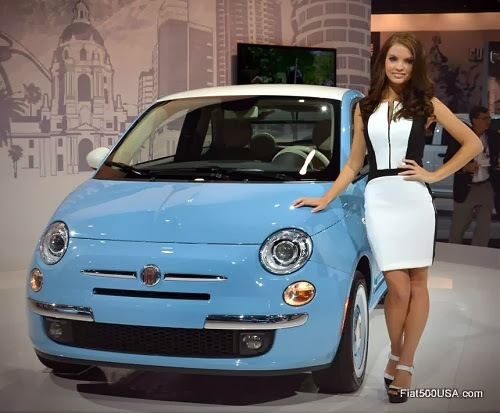 After the video, give us your thoughts on the Fiat 500 USA Forum. 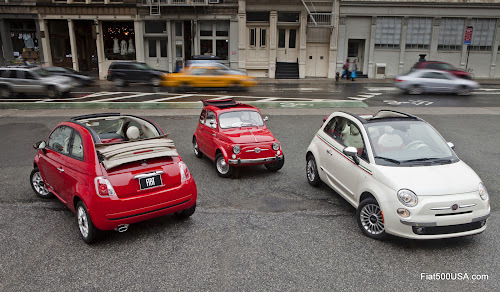 Fiat is holding a year end clearance sale just in time for the holidays. The Fiat Gran Finale sale is your chance to get the Fiat you have always wanted at a fantastic deal. How good? We're talking discounts up to $6,000! But a Fiat 500 is more than just getting a deal, it is about owning an iconic piece of Italian design that brings enjoyment to your life. Go to the Fiat USA website for details and make sure you give the Fiat Studios listed below a call to see what deals they have going on. Hurry because the sale and the cars won't be around for long! The Fiat 500X that recently debuted at the LA Auto Show brings Italian design and world-class substance to the crossover segment. Representing the culmination of 2.5 million hours of engineering, 500,000 hours of lab testing and 5 million kilometers of on the road testing in the most extreme conditions, the Fiat 500X delivers unmatched personalization options and an unprecedented array of safety and security features. 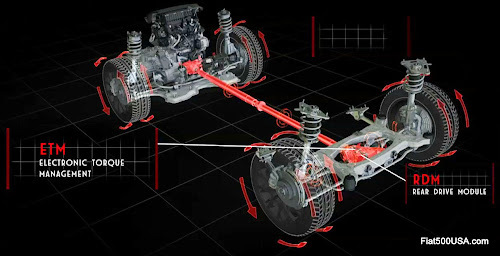 Additionally, the Fiat 500X offers a powerful and capable drivetrain that includes a 2.4 Liter MultiAir 2 Tigershark engine, and a segment exclusive 9 speed ZF automatic gearbox available with three different traction systems - two-wheel drive, two-wheel drive with Traction Plus and a leading edge four-wheel drive system. The following images will better acquaint you with the Fiat 500X and just some of what it offers. There are two versions of the Fiat 500X - one has a sophisticated metropolitan look, the other is a sporty, athletic design. This Fiat 500X Lounge model has an emphasis on luxury and is available in both front-wheel drive and all-wheel drive. Another shot of the 500X lounge. The 2016 Fiat 500X Trekking Plus. The Plus model has standard leather seats and 18 inch aluminum wheels with machined and painted pockets. This is the top of the range model. The Fiat 500X Trekking is available in 12 colors including this tri-coat red, and the tri-coat yellow and matte bronze shown above. You can tell Trekking models by what Fiat calls a "Body color fascia with graphite and chrome “rugged design” accent." The Fiat 500X Trekking has a textured dashboard bezel. The dashboard on 500X Pop, Easy and Lounge models are normally finished in body color. This particular 500X has been customized by Mopar with a contrasting red dash panel that matches the red trim accents. The interior of the 500X is designed to be a place you want to spend a lot of time in and is filled with plenty of storage space. There are two glove box compartments to stow the usual paraphernalia one accumulates during car ownership. The upper glove box has a vent to keep your chocolates cool! and is a 60/40 split design. 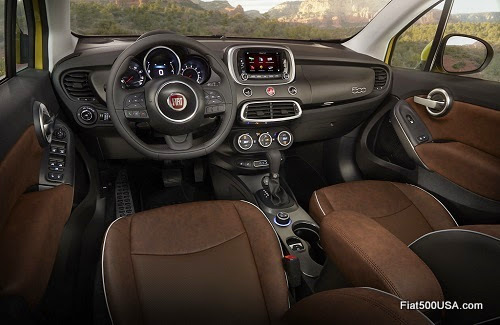 The front seats of the Fiat 500X are broad and comfortable. Side bolstering is pronounced but not intrusive. Front passenger seats are six-way manually adjustable, including for height. Top lever folds the seat back forward for easy access to the rear. Front passenger seat of the 500X folded forward. Note the storage pockets on the seat back for rear seat passengers. also allows the Fiat 500X to accommodate long trunk items. Perfect for trips to Home Depot! The 500X is versatile and has tremendous storage potential for large items. Another view of the rear seats folded down. Note the rear seats fold flush with the rear trunk floor. The Fiat 500X has 18.5 cu ft of trunk room and expands up to 50.8 cu ft with the rear seats folded forward. Plus, an under trunk storage compartment. 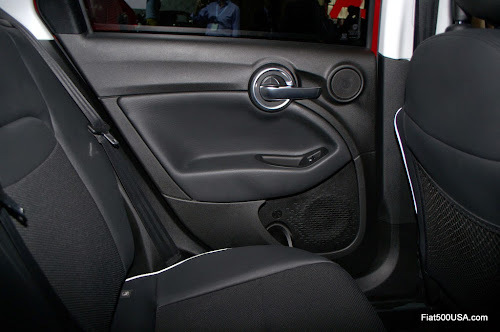 The standard driver's seat of the 500X is six-way manually adjustable, including height. An eight-way power seat including four-way power lumbar power support is available as part of a package. Another view of the driver seat area. The steering column tilts and telescopes and guarantees an excellent driving position. Automatic headlamps are standard on Trekking and Lounge models. Automatic highbeam headlamps are an additional option available on these two models. A leather-wrapped steering wheel with audio and cruise controls is standard on all models except the Pop. Trip computer controls are steering wheel mounted on all versions. Additionally, a heated steering wheel is standard on the Lounge and Trekking Plus and part of an optional package on 500X Easy and Trekking models. "Keyless Enter and Go" includes keyless start and is standard on all 500X models except the Pop. Navigation and radio screen is prominently displayed so the driver doesn't have to take their eyes off the road. HVAC controls are shared with the Jeep Renegade. There are AUX and USB inputs for the stereo. The SD card reader that was standard on European models was omitted from the North American 500X. Center console houses the electric parking brake, ubiquitous cup holders, auto trans shifter and Dynamic Driving Mode selector. Forward of the shifter is a storage compartment complete with an electric power outlet just visible in the corner. Auto: The basic mode calibrated for everyday driving and designed to ensure optimal fuel efficiency, low emissions and driving comfort. This is achieved with a smoother engine calibration, higher servo assistance on steering and a shift point optimized for low CO2 emissions. 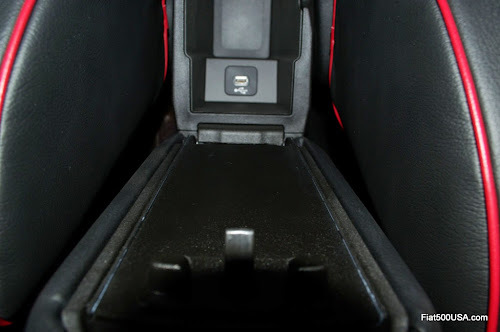 Located in the center armrest between the front seats is a USB charging port. 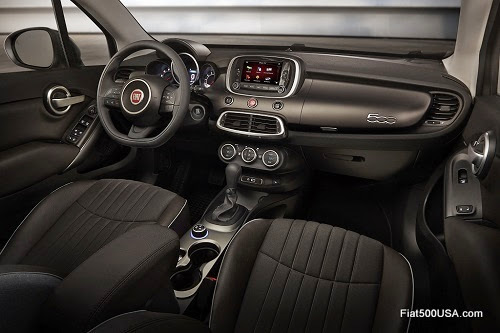 The Fiat 500X features stylish door panels with soft feel inserts including padded armrests. Large door pockets will accommodate a water bottle. Speakers are prominent with careful thought to positioning for best sound reproduction. Front and rear power windows have one touch up and down controls. 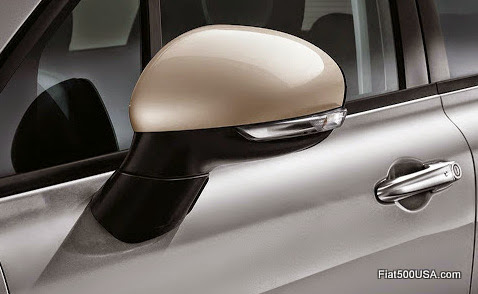 Rear door panels continue the front panel's attractive theme and also contain door pockets with bottle holder. Neat detail: Door lock is integrated in with the door handle. Speed-sensitive power locks are standard. Courtesy and reading lights for front seat passengers. Pivoting sun visors with extenders. Rear seat passengers are treated to their own courtesy light. 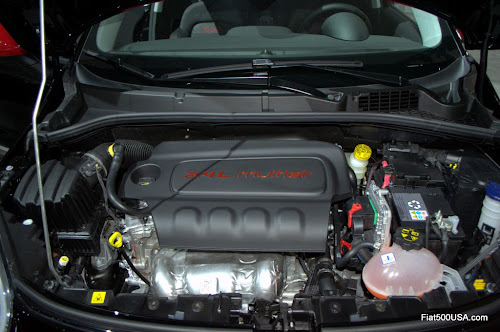 The 1.4L MultiAir Turbo engine used in various Fiats like the 500 Abarth and 500L MPV is available only on Pop models and only with two-wheel drive. All other 500X models come with the 2.4L TigerShark engine with MultiAir 2. MultiAir technology lowers tailpipe emissions, increases fuel economy all while boosting performance, especially at part throttle settings. 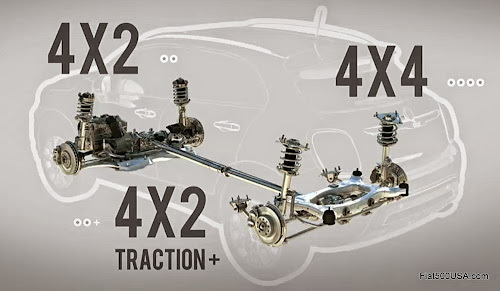 The second generation MultiAir 2 system has additional refinements that further lower exhaust emissions while improving the fun to drive factor. Unlike other cars with conventional EGR systems, MultiAir 2 can more precisely regulate the amount of EGR in the cylinder because it can decouple and open the intake valves independently from the cam lobe allowing the engine to have internal EGR. Valve opening has been optimized to precisely meter the amount of exhaust gas recirculated in the combustion chamber through valve overlap. The results help the 2.4L TigerShark engine achieve a lively, fun to drive character. Headlight on the 500X is a bi-halogen design. European models have a Xenon light option that is not currently being offered on North American models. Turn signal as is the headlight is highly stylized. Fog and cornering lamps are standard on all Lounge and Trekking models. Trekking fog and cornering lamp. The 500X Pop and Easy models do not have fog lights. All Fiat 500X models have a remote keyless/illuminated entry feature. Satin-chrome finish door handles and trim are standard on Trekking models. Heated and power adjustable mirrors with supplemental turn signal lamps are standard equipment across the range. North American 500X models don't get the folding mirrors used in Europe. 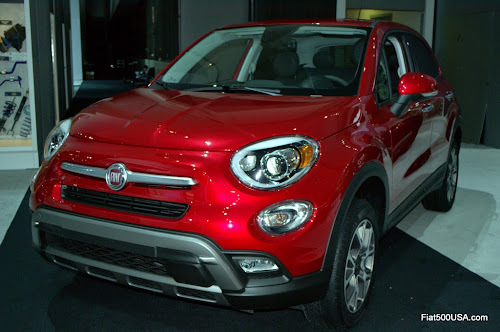 This post showed just some of what the Fiat 500X has to offer. For example, there are 70 safety and security features available including pages of standard equipment. You can read all about them in the following posts.